Rice Krispies Christmas wreaths are an easy, fun festive dessert that’s perfect for the holiday season and always a hit at parties! Hi friends! Are you all full on in the holiday spirit? I sure am after this weekend! And she had her first dance recital yesterday. She’d just done a little ballet-tap class this fall but they had a show at a theater uptown. She did one song with her class and it was adorable! She was so focused on the teacher and making sure she was doing the right moves. And can I just say, girl has some groove in her! And tonight is the holiday dinner and Santa visit at J’s preschool, so we are ALL kinds of in the middle of Christmas fun! 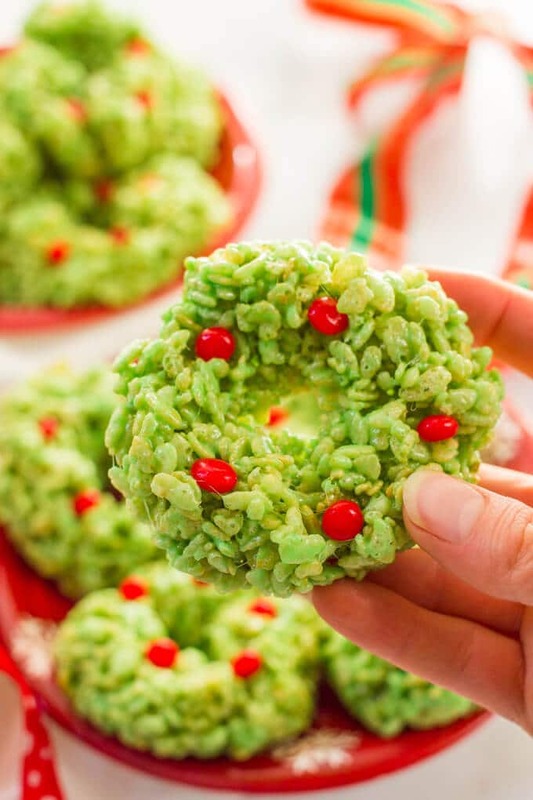 Speaking of Christmas fun, these Rice Krispies Christmas wreaths are pretty much the most fun ever. Granted, they are not my usual healthier dessert. And they just may be the only recipe you see from me on this blog that uses food coloring. Our food coloring is used for sidewalk chalk paint, not for eating. 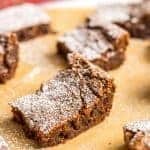 My mom and I do a big baking day each year where we get together and make all of our favorite holiday desserts – and usually a new one we want to try – and these are on the “MUST HAVE” list every year. 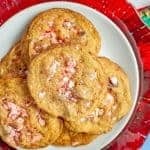 They are always one of the first things to get eaten up and they’re a huge hit at cookie exchanges and Christmas parties. And they are how my mom found out I was pregnant with J. We had our baking day at night that year because it just wasn’t going to work with M, who was 18 months, up and about. I’d gone to my mom’s house, where she had all of our ingredients out and prepped so we could knock out as much as possible before it got too late. She and my dad were having a glass of wine and they offered me one. I said no thanks, since it was a school night and I had to drive home. 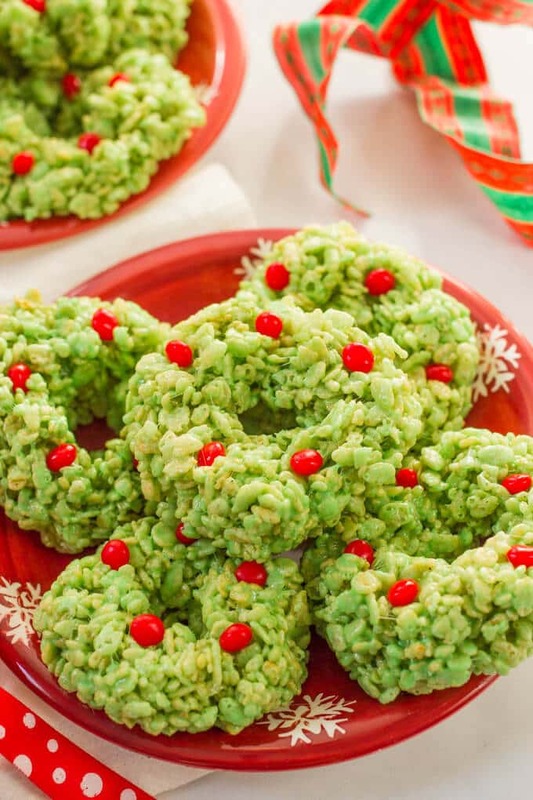 We’d made cookies and chex mix and these Rice Krispies Christmas wreaths. I ate a small one right after we finished. We were chatting and waiting for something else to come out of the oven when I went back and got another small one. It was literally out of nowhere. I was so shocked – and so busted! I just stood there, starting to blush, starting to stammer and I could see on her face that she knew it was true. So I started crying and she started crying and we started hugging. I’d planned to tell them the very next night when my brother and his family were visiting, but they got to hear the news first. All because I had TWO Rice Krispies wreaths and my mom thought I must be pregnant if I was splurging. Guess I just can’t resist these! 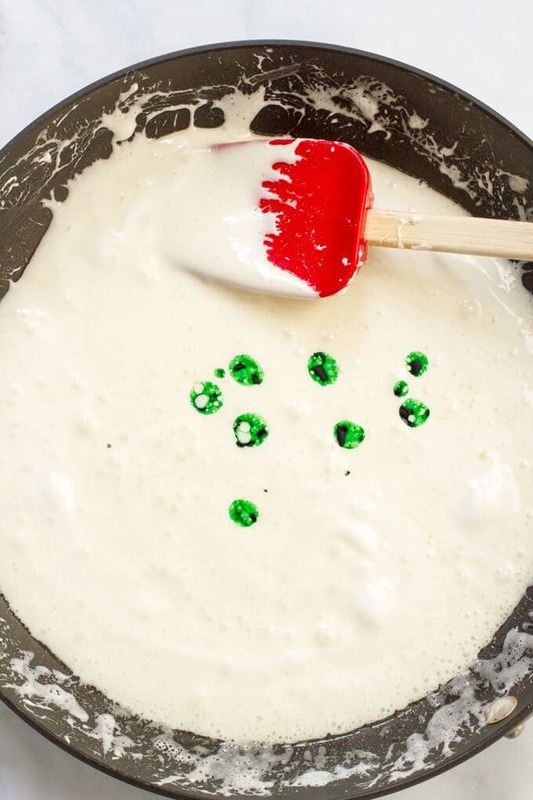 You’ll add the green food coloring until you get it to a good green color (you don’t want it to be pastel). We start with 7-8 drops and usually add several more after we’ve stirred that in. 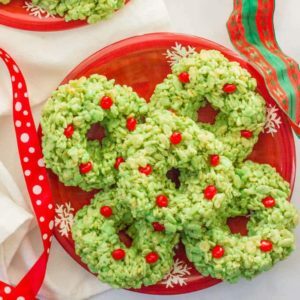 To make the wreaths, you just roll a ball of the Rice Krispies mixture — about the size of a baseball — and use your fingers to make a hole in the middle. Then flatten and shape them and lay them out on a piece of wax paper. These are sticky! We coat our hands in softened butter — and keep reapplying — to keep them from sticking to us. It really helps. 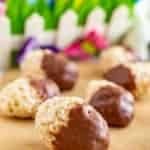 Once you get the Rice Krispies stirred into the marshmallows, you need to work quickly to make the wreaths before the mixture hardens. You also need to work fast to get the red cinnamon dots onto the wreaths so that you can press them in and get them to stick. (Otherwise, they’ll fall off when you pick them up.) It helps to have two people working together – and it’s more fun that way – but I’ve done it by myself, too. Let the wreaths cool completely before storing in an airtight container. Rice Krispie wreaths will keep at room temperature for up to 5 days. 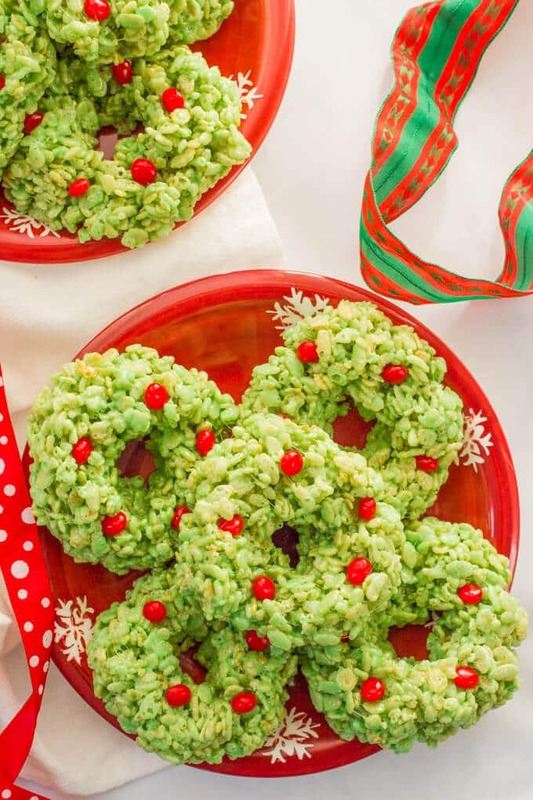 I hope these Rice Krispies Christmas wreaths become part of your holiday traditions, too! 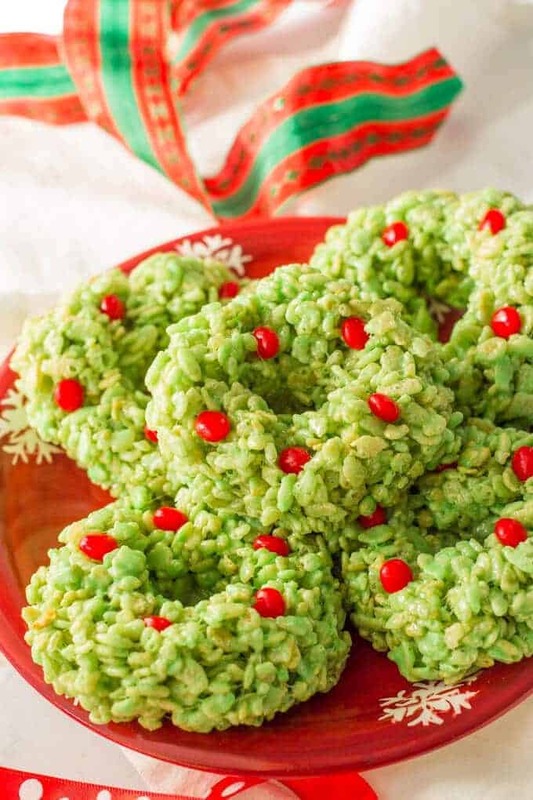 Rice Krispies Christmas wreaths are an easy, fun festive dessert and great for holiday parties! Prepare your decorating station: Lay out a large piece of wax paper and prep some extra pats of softened butter to spread on your hands. Make sure the red cinnamon candies are out and ready to go. Melt butter in a large saucepan over low heat. Add marshmallows and stir until coated in butter. Melt over low heat, stirring occasionally. 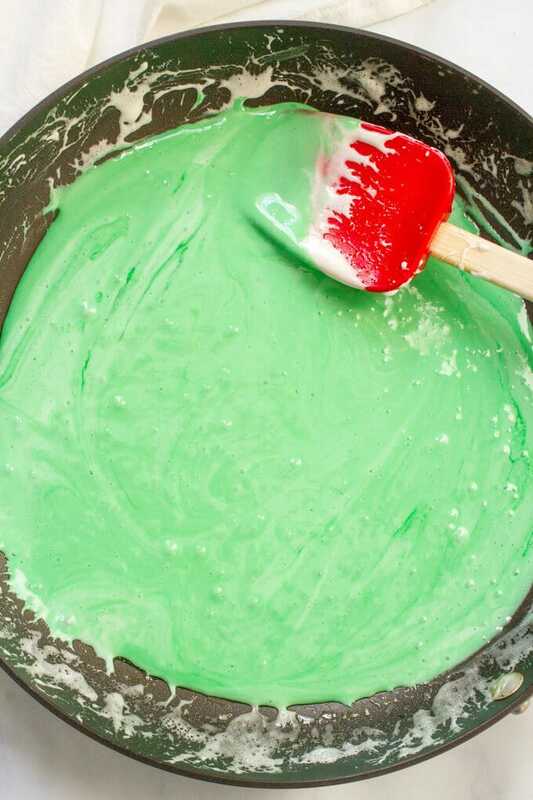 Once marshmallows are completely melted, add green food coloring. Start with 7-8 drops and add more until it’s the right color. Stir well. 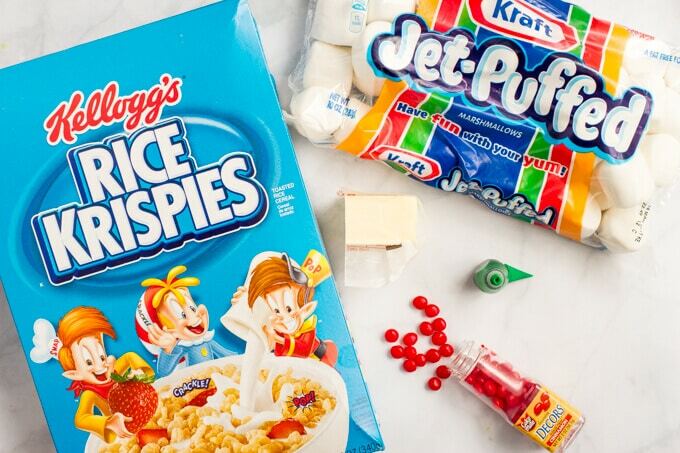 Turn off heat and carefully stir in Rice Krispies cereal until it’s completely coated. Grease hands with extra butter and grab handfuls of the Rice Krispies mixture (be careful not to burn yourself if it’s hot). Roll into balls - about the size of a baseball - and use your finger to make a hole in the center. Flatten the ball into a wreath shape and set on a piece of wax paper. 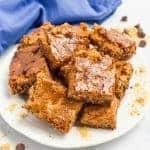 Top with 4-5 red cinnamon candies. 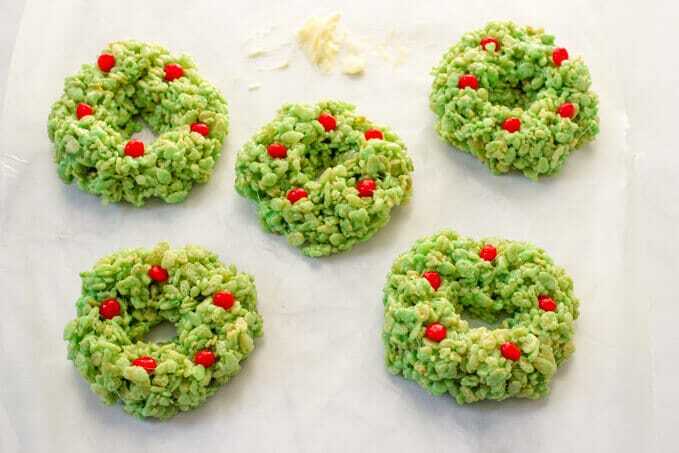 Repeat with remaining Rice Krispies mixture until all the wreaths are formed and decorated. Let cool completely before storing in an airtight container. Rice Krispies wreaths will keep at room temperature for up to 5 days. These are sticky! We coat our hands in softened butter — and keep reapplying as we make the wreaths — to keep them from sticking to us. It really helps. Well it sounds like you had an amazing weekend, girlfriend! My mother and I used to go see the Nutcracker every year when I was younger, so hearing you went with your little girl made my heart smile!! And congrats to M killing it at her recital! I loved hearing about how your mom found out you were pregnant!! Too funny an extra one of these Rice Krispies Christmas wreaths gave it away!! Speaking of, these are absolutely FABULOUS! 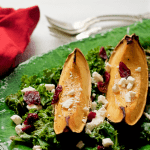 So festive and fun, not to mention absolutely delicious! Perfect for the season! Pinned!! Cheers! Thanks Dawn!! It was a festive weekend all around – loved every minute! These are super cute! I’ve never made Christmas wreath rice krispies, but my family does do our fair share of cookie baking during the holidays. Like you, I don’t typically use food coloring and as I was making sugar cut out cookies this weekend I was wondering if there was a better option for food coloring…do you know of any? I hear ya Tara – I steer clear of the stuff except for these Rice Krispies wreaths. I have used beet juice, pomegranate juice, cherry juice and blueberry juice to color icing before for cupcakes and cakes. It should work for a cookie frosting too but you would have to be careful not to use much so it doesn’t get runny. It won’t be as brightly colored but it turns out pretty! 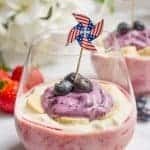 (I used blueberries to make a purple icing for my daughter’s birthday cake one year and it was beautiful!) Hope that helps! These are a hit with kids of all ages 😉 And the dance class was fun! She wants to move on to gymnastics, but I think it was a good experience – especially having a recital and being on stage. Confidence builder, if nothing else!